question_answer1) _______is water in its gaseous form. question_answer3) Pick the odd one out. question_answer5) The measure of how much material makes up an object is called the _____. question_answer7) Which of the following substance is able to sublime? question_answer8) Pick the correct option. question_answer9) Baking of cake is an example of ______ . question_answer11) Which of the following is a physical change? question_answer12) Which of the following has a definite shape and volume? question_answer13) Which of the following has a definite volume but no definite shape? question_answer14) The conversion of ice into water is an example of ______ . question_answer15) Which of the following takes place when water vapour changes into ice? question_answer16) The diagram given below depicts which of the processes of the change of state of matter? question_answer17) Gases consist of particles that ________. question_answer20) Opposite of freezing is ________. question_answer22) A chemical change takes place when one form of matter changes to ______. question_answer23) Directions: Answer the following questions by studying the above table. How many examples of physical changes are there in the grid? question_answer24) Directions: Answer the following questions by studying the above table. How many examples of chemical changes are there in the grid? question_answer25) Why can't we make statue of water? A: Liquid can't have its own shape. B: It is hard to change shape of water like iron. question_answer26) Read the statements and choose the correct option. Statement A: Physical change is irreversible. Statement B: Chemical change is irreversible. question_answer28) Directions: Fill up the grid by answering the following questions. 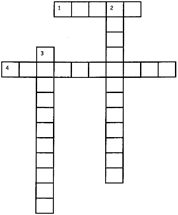 (Across 1) These are the small particles of which the matter is made up of ___. question_answer29) Directions: Fill up the grid by answering the following questions. (Down 2) The temperature at which the solid gets converted into a liquid ___. question_answer32) Which change of state occurs when particles in a solid begin to move slowly past each other? question_answer33) I painted the inner four walls of a box. Then I put an ice block into it such that it did not touch the walls, but I couldn't do the same when I put water in that box. Why? question_answer34) Read the following statements and choose the correct option. Statement A: I can easily compress the water in a jar to reduce its volume. Statement B: When water evaporates, it turns into solid. question_answer36) Read the following sentences and choose the correct option. When a solid changes to a liquid, it is called melting. Liquids are easy to compress. When a gas changes into a liquid, it is called condensation. The particles of a gas are packed tightly together. question_answer37) Read the following sentences and choose the correct option. When solids reach their melting points, they become liquids. Plasma is a state of matter. When a gas reaches its condensation point, it becomes solid. Gases are hard to compress. question_answer38) Directions: Read the passage and fill in the blanks with suitable options. When a solid turns into a liquid it is called __ (38) __. There is a temperature at which this Happens called the melting __ (39) __. As the energy in the molecules increases from a rise in temperature, the molecules start moving __ (40) __. Soon they have enough __ (41) __ to break free of their rigid structure and start moving around more easily. The matter becomes a __ (42) __. The melting point of water is 0 degree C (32 degrees F). When the opposite happens and a liquid turns into a solid, it is called __ (43) __. question_answer39) Directions: Read the passage and fill in the blanks with suitable options. When a solid turns into a liquid it is called __ (38) __. There is a temperature at which this Happens called the melting __ (39) __. As the energy in the molecules increases from a rise in temperature, the molecules start moving __ (40) __. Soon they have enough __ (41) __ to break free of their rigid structure and start moving around more easily. The matter becomes a __ (42) __. The melting point of water is 0 degree C (32 degrees F). When the opposite happens and a liquid turns into a solid, it is called __ (43) __. question_answer40) Directions: Read the passage and fill in the blanks with suitable options. When a solid turns into a liquid it is called __ (38) __. There is a temperature at which this Happens called the melting __ (39) __. As the energy in the molecules increases from a rise in temperature, the molecules start moving __ (40) __. Soon they have enough __ (41) __ to break free of their rigid structure and start moving around more easily. The matter becomes a __ (42) __. The melting point of water is 0 degree C (32 degrees F). When the opposite happens and a liquid turns into a solid, it is called __ (43) __. question_answer41) Directions: Read the passage and fill in the blanks with suitable options. When a solid turns into a liquid it is called __ (38) __. There is a temperature at which this Happens called the melting __ (39) __. As the energy in the molecules increases from a rise in temperature, the molecules start moving __ (40) __. Soon they have enough __ (41) __ to break free of their rigid structure and start moving around more easily. The matter becomes a __ (42) __. The melting point of water is 0 degree C (32 degrees F). When the opposite happens and a liquid turns into a solid, it is called __ (43) __. question_answer42) Directions: Read the passage and fill in the blanks with suitable options. When a solid turns into a liquid it is called __ (38) __. There is a temperature at which this Happens called the melting __ (39) __. As the energy in the molecules increases from a rise in temperature, the molecules start moving __ (40) __. Soon they have enough __ (41) __ to break free of their rigid structure and start moving around more easily. The matter becomes a __ (42) __. The melting point of water is 0 degree C (32 degrees F). When the opposite happens and a liquid turns into a solid, it is called __ (43) __. question_answer43) Directions: Read the passage and fill in the blanks with suitable options. When a solid turns into a liquid it is called __ (38) __. There is a temperature at which this Happens called the melting __ (39) __. As the energy in the molecules increases from a rise in temperature, the molecules start moving __ (40) __. Soon they have enough __ (41) __ to break free of their rigid structure and start moving around more easily. The matter becomes a __ (42) __. The melting point of water is 0 degree C (32 degrees F). When the opposite happens and a liquid turns into a solid, it is called __ (43) __. question_answer45) Which of the following is an example of condensation? question_answer47) Which of the following change once occur will not come back to its original shape & size? question_answer48) Which of the following can be compressed easily? question_answer50) Shreya loves to eat icecream. Her mom purchased two ice-creams for her. She had eaten one icecream and kept the other one in the kitchen and went to play. When she came back she noticed the icecream got melted. She started crying loudly. As an elder brother of Shreya, how will you manage this situation?